Select your field of interest by asking yourself “what did I enjoy most from the course?” Writing your dissertation on something you actually really enjoy will make all the difference, not only will it seem less overwhelming but you will have a better end result. Once you know the field you can pick an approach or stance you want to take. It’s important to be specific and a good idea is to come up with a working title for your dissertation as a guide. From there you can work on your outline where you should go through each section and clearly define what your objective for each part is. Each part of your dissertation needs to be strong, relevant and tie into the other points. Your outline is extremely important because it’s the skeleton of your dissertation and something that you will need to continually refer back to while writing. What future research could illuminate the issue further? Doing the research for your dissertation is going to be the longest and probably most draining part of the whole sha-bang. The research for your dissertation needs to delve deeper than probably anything else you’ve ever written, no leaf, stone or boulder can be left unturned. Use a variety of mediums and think creatively, go to ask many libraries as you can, look online, ask for help and think globally. Make sure to communicate with your academic advisor or professor to see if they may have some insight or could give you access to more information on your topic. It’s extremely important to keep track of all the books you use, with their page numbers, so that you can easily go back to any resource you’ve used. Sourcing is a vital part of your dissertation so taking the time to make sure you’re doing it properly is worth it. Try our ExamTime Notes tools to keep track of all your sources, including images and videos that you may want to incorporate later. After spending countless hours doing research, finally sitting down to write your dissertation may feel like a breeze… That is until you actually start. It’s usually better practice to start writing the areas that you know and can easily flush out, and then moving onto the harder stuff. Be prepared to write three or four or five drafts. It’s crucial to find your style of writing in order to effectively communicate your ideas and opinions. Even with the best research, if you don’t properly explain yourself, no one will fully understand what you’re trying to say. Keep your sentences concise, don’t repeat yourself and use a variety of headings and subheadings to stay organized and to make it easier to read. Although your dissertation should be predominantly made up of original thought, it is also important to incorporate and refer back to the ideas and theories of others to help enhance your points. 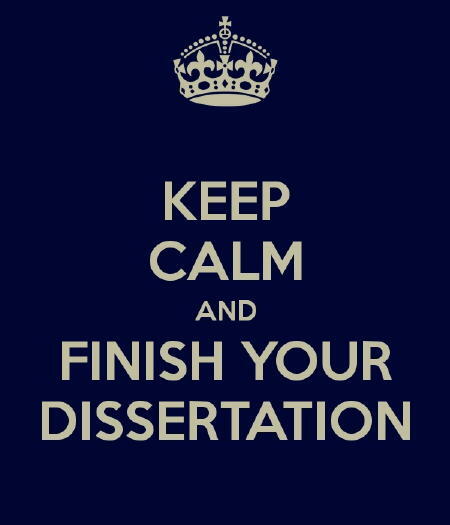 Definitely make sure to give yourself plenty of time to edit and review your dissertation. First, make sure to utilize your outline when reviewing to remind yourself of the purpose of each section. Look at each section of your dissertation, breaking down each paragraph to make sure you have effectively communicated your desired argument. Take your time while doing this and take breaks to maintain perspective. Work your way up from looking at each sentence, to each paragraph, to each section and then finally the dissertation as a whole. It’s also very important to get as many other people to read your dissertation as you can before submitting. Find someone you trust to go through it and edit, looking to make sure it all makes sense. It’s easy to skim over little details yourself so find someone who will go through it with a fine tooth comb. ExamTime is here to help you with all your dissertation needs. We offer a whole series of free, online study tools and resources that are accessible to anyone. Check out our Mind Maps, Flashcards, Notes, Quizzes or Study Planner to make the most of your dissertation study time and be successful. See some our Success Stories and see how other students and teachers are using our tools.